For the next Club we thought we’d go a bit Sci fi. Dr Who figures (11th and 12th ) are from the now long defunct range from Crooked Dice, the Doctor has at least one regeneration if he comes a cropper! After an epic amount of painting I had managed to get together two dalek armies and still have some left for the children to keep for themselves. Some shots of the battlefield, we used a street in other games, sadly no photos of that! some of the conversions for sale! All the Daleks and other aliens were sold and we raised enough funds for our next project. During last summer I purchased some figures from crooked dice… they were dead ringers for Captain Scarlet and other Spectrum personnel . I decided then that somehow i would use them in a table top game………but who could they fight? 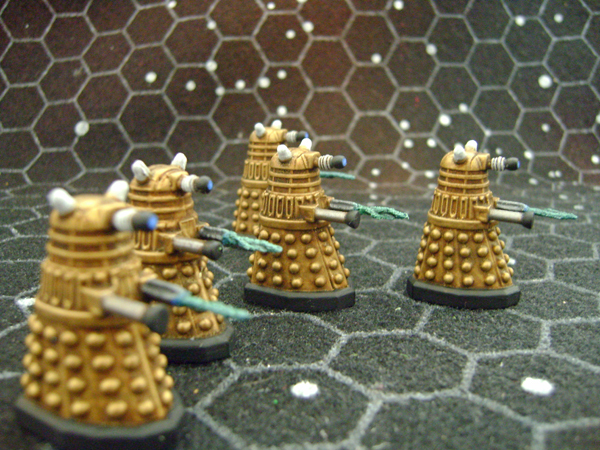 Eventually it came to me, Sci fi is a leap into the imagination……Daleks!! That lead onto the purchase of variuos Dr who figures, a Tardis…..then late last year Nov/Dec i started listening to the Gerry Anderson series U.F.O. whilst i did my painting, eventually working my way through all episodes. That and the sad demise of Gerry Anderson on boxing day last year, lead me into purchasing a host of old Imai kits from both series (Scarlet and UFO)…..a fair bit of nostalgia crept into the whole idea. I remembered the time I had gone to see Gerry Anderson in the early 1990’s during his one man show with one of my friends…..again sadly no longer with us. I had built an Imai “Sky one” for one of my friends birthdays as a gift……for some reason i felt the need to buy another……then some mobiles, a spectrum helijet and some SPV’s, a MSV….a Stingray…and a Shado interceptor…all rare kits and getting rarer! All these would be used in the table top game along side some daleks and the crooked dice miniatures………..so in the coming weeks there will be lots of posts as i complete the various vehicles, craft and figures…most of which are a work in progress as we speak!…So keep checking back in the coming weeks….lots of interesting stuff to come! Leave a comment	| posted in 28mm, Captain Scarlet, Davros and the Daleks, DR Who, Gerry Anderson, Sci Fi, U.F.O./S.H.A.D.O. These have been finished for a while, I’ve just been struggling to find the time to post! So many other interesting goodies to tell about, so many works in progress! 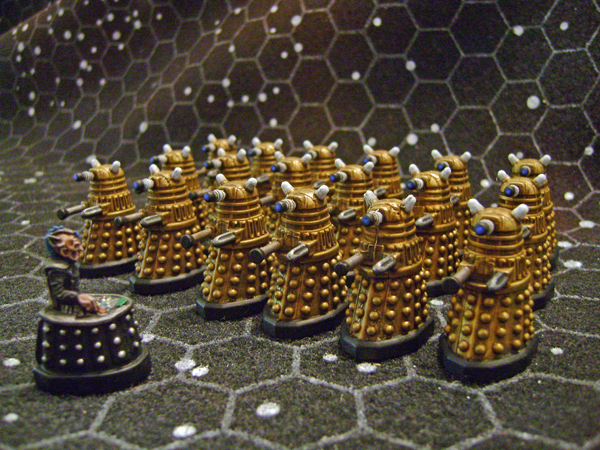 but I hope you like the daleks…it was fun painting them, they turned out very well, I still have many more to paint! I added some “Pyrotechnics” to some of them. These muzzle blasts are from Armorcast and make sci fi figures just a little bit more dynamic. Been wanting to do this for a while…it also needed to be very cheap. 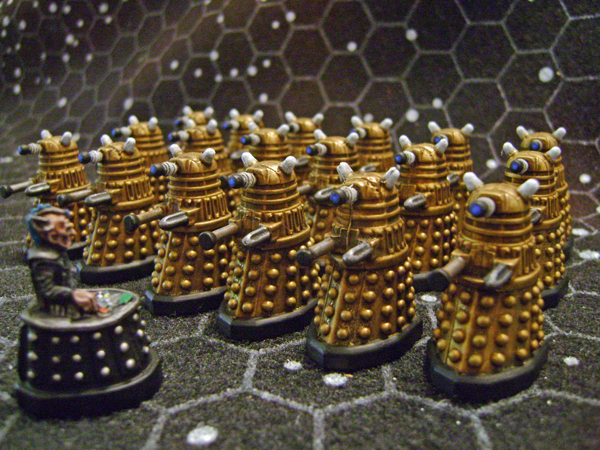 Sometime ago my attention was drawn to the fact that large 28mm scale Daleks were available on ebay. They were plastic freebies with a Dr Who magazine here in UK. Easiest to obtain are the New Paradigm versions which are brightly coloured. 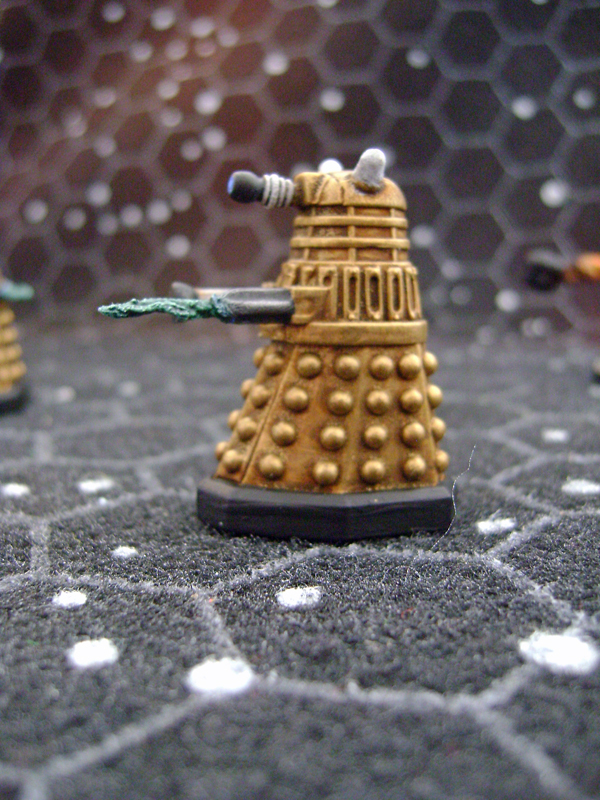 Have to say my favourites are the Gold “Ironsides” style dalek from 2005 series. These can also be found on ebay from time to time, and i would imagine they also were free gifts from the same magazine..though these are more difficult to get and only ever in small numbers. I have now collected a large force of both types and look forward to finding some time in new year to get some paint on these as well as do a few conversions…Like a Special weapons dalek. A suitable Davros figure is available from Black Tree design but I cut him from his Dalek mobility scooter and cut down a new paradigm dalek base to bring him up to th required height….this resulted in three rows of sensor domes rather than four…but that is a minor detail to me….he is a new paradigm davros! 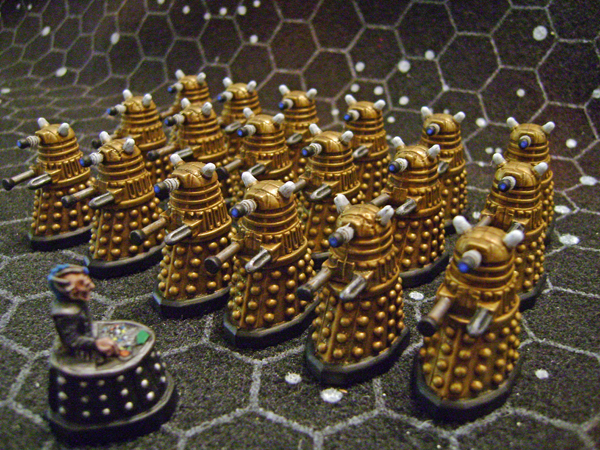 Now that I have The Ironside Daleks they will be painted Gold…one will become the supreme dalek the rest will be Davros’ Praetorian Guard. The New Paradigm versions will be painted in the various bright colours from the show. 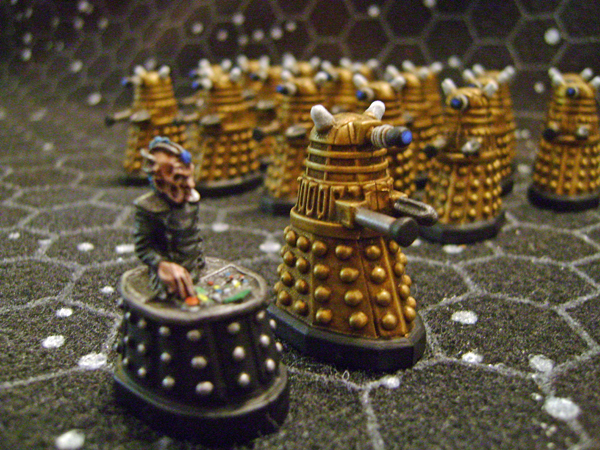 I have also used a Warlord games Bolt action SS Vampire removed his fangs and made him a high ranking Kaled officer, it will give davros someone to hang out with as daleks have a limited range of topics to talk about.